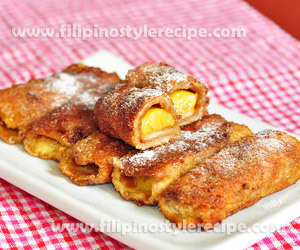 Filipino Style Recipe: Banana rebosao or saging rebosado is a sweet delicacy made from crystallized banana. 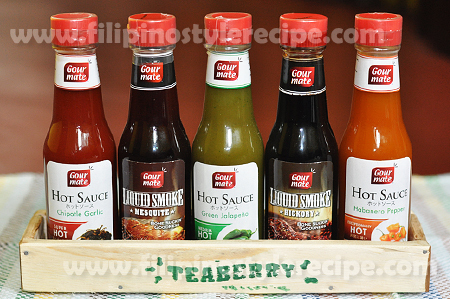 This dish is popular in southern part of Mindanao specially in Zamboanga and Basilan. 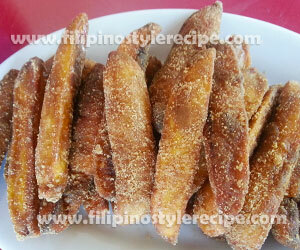 Bananas comes fried then mix in sugar syrup until well coated and crystallize. This is similar to banana cue but different in cooking procedure. 1. In a frying pan, heat oil then deep fry bananas for 3-5 minutes or until golden brown. Drain and set aside. 2. In a sauce pan, boil water then add sugar then keep stirring until thick and sticky. 3. Add fried bananas then mix until well coated. Keep stirring until sugar are crystallize and almost dry. 4. Transfer to serving plate and let it cool before serving. 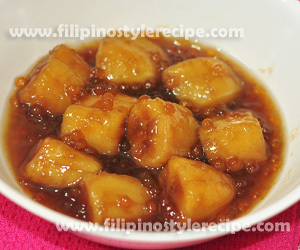 Filipino Style Recipe: Minatamis na saging at sago is another famous Filipino dessert made up of plantains and tapioca pearls cooked in brown sugar syrup then usually served with ice or milk. This dessert is similar to saging con yelo which is easy and simple to prepare and usually serve for meryenda(mid-afternoon snack). 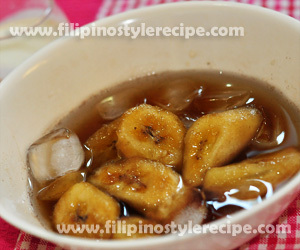 Minatamis na saging at sago is commonly sold along the streets or carinderia and usually serve during summer season. 2. Add plantains, cooked sago, vanilla extract and salt then simmer in a low heat for 15 minutes or until soft. 3. Let it cool then transfer into serving bowl. 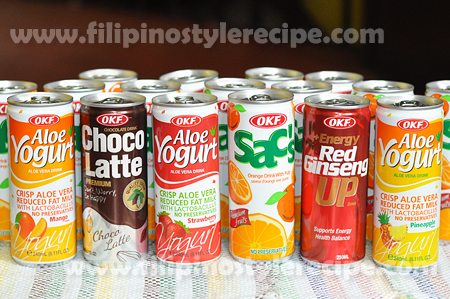 Serve with ice and milk. 1. Soak sago pearls in water for 3 hours then cook in boiling water for 15 minutes or until turn clear. 2. Stir constantly to prevent sticking then drain and transfer to a bowl of cold water. Set aside. 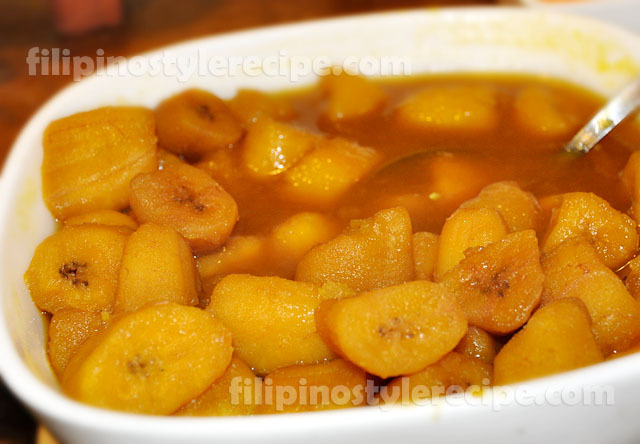 Filipino Style Recipe: saging con yelo or saging con hielo is another famous Filipino dessert made up of plantains cooked in brown sugar syrup then usually served with ice and milk. 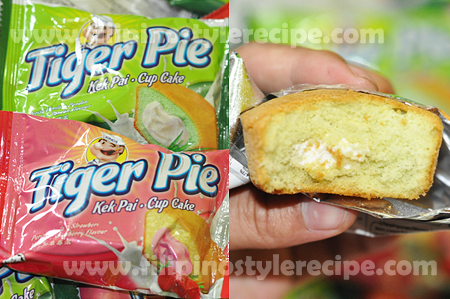 This dessert is easy and simple to prepare and usually serve for meryenda(mid-afternoon snack). Saging con yelo is commonly sold along the streets or carinderia and usually serve during summer season. 2. Add vanilla extract and salt. 3. Add plantains then simmer in a low heat for 15 minutes or until soft.